No more food for now, I promise. Now we will deal with people, people wearing costumes. 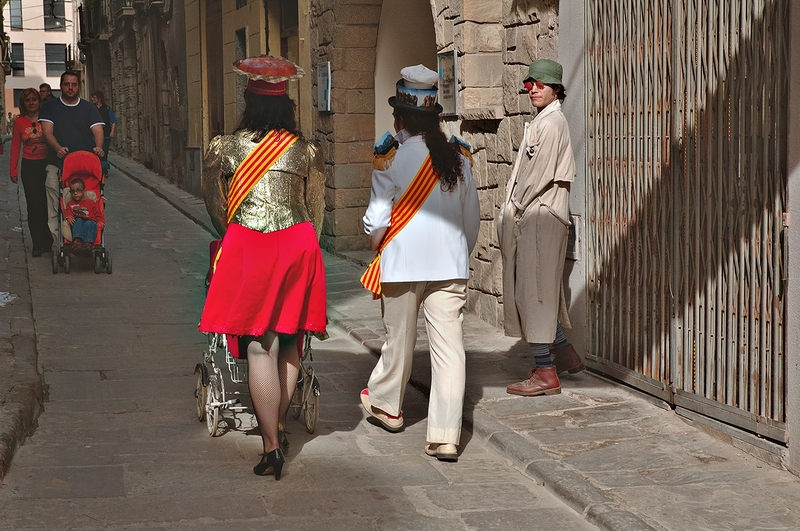 These three characters were walking down the streets of a small town near Barcelona called Monistrol de Montserrat. You would think: it is a boring picture for a post,...it is! My archives are running out of images!...help. On second thought, why not just cropping the lady's feet. It would be great for promoting DP theme day - please read the Recommended section below - From the Waist Down Theme. Besides, I like the funny guy on the right standing in the sun with a smile, almost detached from the scene: maybe you could help me with the character, is he Mr. Gadget or Keanu Reeves traveling incognito in Europe?. You were wise not to crop this shot to suit the theme. It is a very interesting photo. The kind that you show school children and then ask them to write a story about the photo. oh,Carlos,people are also very welcome! the photo is great:great composition:half dark, half bright. someone showed the great customes with their backs,and someone showed his smile and funny expression. very vivid moment in a small lane. oh, i like this "real life" style photo. life itself is also very beautiful,right?? fishy looking guy...what was he doing exactly? Lol! To me the guy looks like a flasher! Any momment now he will spread open his trenchcoat and...voila! 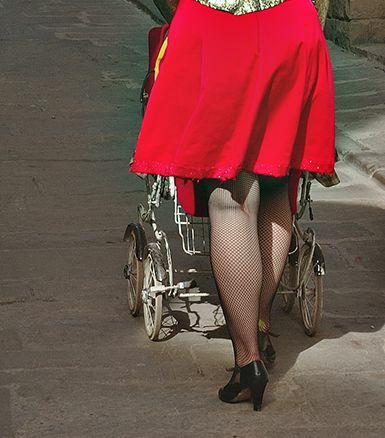 Really nice candid picture this is, I wonder what the significance of the costume is? What about the hats too?